It is not uncommon that we hear clients and visitors say things like, "Wow! This is like a whole other world in here!" or, "I feel like I have traveled back into time." Well, we feel the same way. 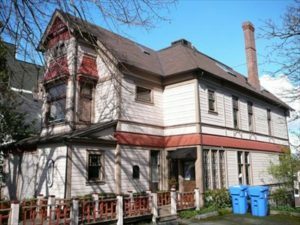 This blog is about the feel of our space, and most importantly the history of our building, the Henry Drum House. Without understanding the importance of the history that took place inside these walls, we cannot fully appreciate the beauty that has become Carpe Diem Massage. Take a peek with us down the rabbit hole, and get a glimpse of the past. The Henry Drum House was built in 1888, for none less than Henry Drum himself. Mr. Drum made an impressive contribution to the development of early Tacoma. He was a business man, and a civic leader. He was elected Mayor of Tacoma. 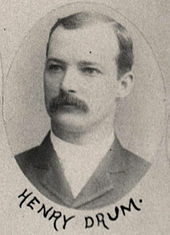 Henry was Tacoma's 5th mayor (if the mayors who were elected after the consolidation of Old and New Tacoma in 1884 are considered) but if the Mayors of New Tacoma are also included, then Henry Drum would be considered the 7th Mayor! Mr. Drum helped to solve many problems for the ever growing city of Tacoma, including sewage disposal, and transportation! Henry Drum resided in the home with his wife and 5 children, for an uncertain amount of time. The former Mayor died on March 20, 1950 at the age of 92. It is easy to see why people feel a certain level of importance when they enter Carpe Diem Massage- which is located in the garden level of the Henry Drum House. We feel that the "Rabbit Hole" begins at the top of our outside stairs, leading down into the entrance. It has beautiful rock walls, blooming with wild flowers in the spring. That first step is like stepping away from the hustle and bustle of the busy St. Helen's ave, into a world of our own. Many clients have a bit of trouble locating us for their first visit, and in return are often shocked that a place like exists somewhere they have unknowingly passed several times! It is a best kept secret of Tacoma, and it is our own little rabbit hole. Upon entering the Carpe Diem door, you will immediately notice unique one of a kind furniture, and antiques, representing the era that was the Henry Drum house in it's original days. You will see some modern twists representing the world today, and most importantly you will feel warm and invited. Each massage room has its own identity- look- and feel associated with them. The largest room- called the "Red Room" among the staff gets its elegant feel from the deep burgundy walls, candles, white chiffon curtains, fire place, and rod iron accents. This room is most commonly used for our couples massage sessions. The next room is known as the "Elemental Room" this room features beautiful turquoise blue walls, a tranquil fountain, wood stick strategically tied together, a vintage golden mirror, candles, and even a fire place. One of the walls is original granite, from when the house was originally built. Each of earths elements are represented in this room for a very calming feel. 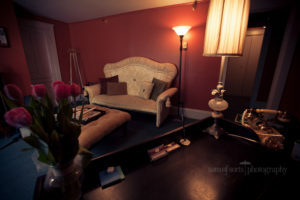 The Elemental room is most often used for pregnancy massage, because of it's nurturing feel. Our final room is simply called the "Little Room", but don't let the name fool you. It may be smaller, but it is full of old historic charm with original granite walls, and candles. We hope now you have a new found outlook on the space that is Carpe Diem. We are so grateful to be located in a space that is rich with a history of its own. Thank you for joining us on our journey- down the rabbit hole.